If you’re craving a new weapon to do some damage with on the Fortnite island with the sky all cracked and whatnot, there’s a new option coming. 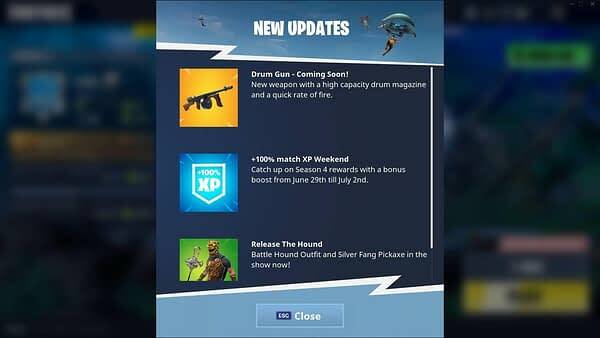 Epic Games has started posting some new stuff coming on their feed, and the latest item to appear is a brand-new Drum Gun. The image below was loaded up on Reddit and caught the attention of several players, as this looks more like a traditionally controlled machine gun than the actual machine gun that’s in the game — meaning it may have the possibility of having better aim and firing more rounds per second. Since this is just showing up in people’s feeds and isn’t officially being announced by the company yet with any details, we don’t have any way of knowing how good it will be or how it will affect gameplay. Not to mention there’s no confirmed release date for it to be entered into Fortnite play. But, as is the case with a lot of their gear, it’s probably only a few weeks away from being put in the game if they’re confident enough to promote it. We’ll probably get proper details sometime this week when they talk about the next update.